Equities started off the new year in strong fashion, driven by the recently enacted GOP corporate tax cuts and continued improvement in economic fundamentals throughout most of the world. However, investor enthusiasm was punctured in February by concerns of rising inflation and borrowing costs—hitting both the bond and equity markets. March brought more bad news to equity investors in the form of trade war fears between the US and its largest trading partners. When the quarter ended, the global equity markets’ nine quarter winning streak ended, and with it the low levels of volatility. However, emerging market equities bucked the global trend by posting a 1.4% return for the quarter. Fixed income markets retreated during the quarter also, with longer duration securities hit harder than shorter ones. US unemployment held steady during the quarter at 4.1%. This stable figure hides the good news that more Americans were employed during the quarter as more were seeking employment. In March, 60.4% of the US population was employed versus 60.1% in December. But with the baby boomers now retiring, we are unlikely to ever match the 63.4% peak achieved back in 2006. As the chart below shows, other developed markets are also experiencing historically low levels of unemployment. Despite the strong employment situation, wage inflation continues to be modest and in the US, only slightly above inflation, only 2.7% year on year. The Federal Reserve (Fed) raised its benchmark interest rate by 25bps (0.25% points) to a range of 1.5% to 1.75%, its sixth increase since the financial crisis, and its first under the new chairman, Jerome Powell. Fed officials forecast three more rate hikes in 2018, consistent with previous guidance. Overseas, major central banks have yet to follow the Fed in raising rates. However, they have begun cutting back their stimulative quantitative easing (QE) programs as shown in the chart. Investors’ long-term US inflation expectations continued to tick up, rising to 2.05% per year over the next 10 years, up from 1.85% last fall, and 1.7% when President Trump was elected. The primary drivers of the rising inflation expectations, in our opinion, have been the tightening labor market, the reduction in excess capacity utilization, rising purchases caused by a stock market-driven wealth effect, higher energy prices (see chart below), a weaker US dollar, and the prospect of tariffs on imported goods. The Congressional Budget Office (CBO) released a more detailed analysis of the impacts of the recently enacted GOP tax cuts on the US economy and federal debt levels. The CBO now projects the cumulative deficit for the 2018-2027 period to be $1.6 trillion greater than its projection conducted in June 2017, prior to the GOP tax cuts. On a percentage of gross domestic product (GDP), the federal deficit is to estimated to go from 78% at the end of 2018 to 96% by 2028—the largest since WWII and well over twice the average over the past five decades. The CBO estimates take into account the stimulative nature of the tax cuts on economic growth, as well as larger issuances of debt required to finance higher deficits. The tax cuts are expected to goose economic growth this year and next (the “sugar high” in the chart below), but then fall below trend during the subsequent four years (the “sugar crash”) as higher interest rates inflict their damage. The boost from strong economic growth, lower corporate tax rates, and a weak US dollar will be in full evidence during this earnings season. Analysts forecast S&P 500 earnings to be up nearly 20% from a year ago. As North Atlantic Free Trade Agreement (NAFTA) renegotiation talks between the US, Canada, and Mexico entered their late stages, Trump upped his protectionist trade rhetoric. In early March, Trump announced 25% and 10% tariffs, respectively, on all imported steel and aluminum. But by the end of the month he had exempted most of the largest US suppliers. The world’s largest steel producer and exporter, China, was notably left off the list of countries exempted from the tariffs (although US imports of Chinese steel and aluminum are rather small). China retaliated by applying its own tariffs on approximately $3 billion of imports of 128 different US products, including pork, aluminum scrap, nuts, and fruit. China was again at the receiving end of Trump’s trade rhetoric in late March with notice of 25% tariffs to be applied to $50-60 billion of Chinese imports, and new restrictions on US technology transfers and acquisitions by China. Predictably, China announced its intention to apply tariffs on $50 billion of US imports. Not to be outdone, Trump upped his threat with tariffs on an additional $100 billion of Chinese imports. I will address the growing risks of a major trade war in the Outlook & Strategy Positioning section of this AlphaGlider CIO Commentary. Turning to geopolitics, tensions continued to rise between Russia and the West. Russia appears to be behind the attempted assassination on UK soil of a former Russian military intelligence officer who had spied for the UK, and his daughter. Reminiscent of the Cold War, 27 western countries expelled a total of 150 Russian diplomats, and military and cultural attachés, with the Russians responding in kind. In a more meaningful move, the US went after Russian President Vladimir Putin for his interference in the recent US presidential election by imposing sanctions on seven Russian oligarchs and 17 top Russian government officials who have close ties to Putin. And as I write this, the US, UK, and France retaliated militarily against the Russian-backed Syrian regime after reports that Syria killed at least 40 civilians in a chemical attack on a rebel-held suburb of Damascus. If you want to get a better understanding of how Putin came to power and how he abuses it, all in a quick, entertaining read, I strongly recommend Bill Browder’s Red Notice. Browder was a successful investor in Russian equities until he and his staff were targeted by Putin. After his tax accountant, Sergei Magnisky, was murdered by Russian officials in prison. Browder made it his life purpose to hold Putin and other Russian officials responsible, pushing for the passage of the Magnitsky Act in the US in 2012, and of similar laws in the UK, Canada, Estonia, Lithuania, and Latvia. It was the Magnitsky Act that the Russian lawyer Natalia Veselnitskaya was lobbying to have repealed when she met with Donald Trump Jr., Paul Manafort, and Jared Kushner at Trump Tower in June 2016. N. Korean President Kim Jong Un and Trump have tentatively agreed to meet in May or June to discuss terms and conditions that could lead to denuclearization on the Korean Peninsula. Although expectations for a breakthrough are low, moving from bellicose threats and insults to a face-to-face discussion is a small, but welcomed step. The recent hawkish shift in Trump’s foreign policy team (Mike Pompeo replacing Rex Tillerson as Secretary of State, and John Bolton replacing Lt. Gen. H. R. McMaster as National Security Adviser) is a sign that Trump will not be in a compromising mood when he sits down with Kim. This same shift also foreshadows a more aggressive American approach to Iran and the Iran nuclear deal to which the US is party. Lastly, special counsel Robert Mueller’s investigation of Russian interference in the 2016 election and alleged collusion with Trump’s campaign continues unabated. To date, over 100 criminal counts have been made against 19 people and three companies. Five of the 19 individuals have pleaded guilty, including three of Trump’s close associates. From an investor’s point of view, we think the investigation is most relevant on the impact it may have on this November’s midterm elections. Should the GOP lose control of either the House or Senate, there will likely be a freeze on further business-friendly deregulation. And further down the road, the recently lowered corporate tax rates could be in jeopardy should the result of the investigation contribute to a change in the party controlling the Oval Office come 2020. As for our benchmarks, this was the first quarter since the third quarter of 2015 that all AlphaGlider strategies suffered losses. However, our concerns over high asset valuations, an economic cycle long in the tooth, and rising risks to global free trade ameliorated these losses. All of our strategies were down less than 50% of that of their respective benchmarks, each putting up between 50 and 75bps of relative outperformance. 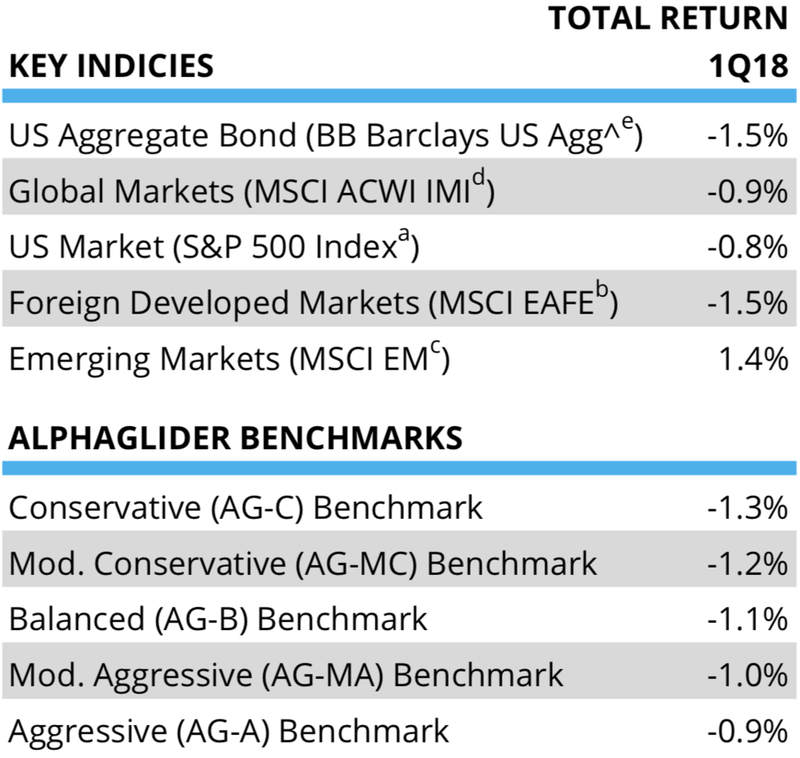 AlphaGlider strategies benefited from their overweight equity exposure to emerging markets (SPEM)2 and Singapore (EWS), which were up 3.0% and 2.9%, respectively, during Q1. With inflation expectations and interest rates continuing to rise, AlphaGlider strategies were helped by their preference for shorter duration (SPTS, SPSB) and inflation-protected securities (STIP, SCHP). We were also helped during the quarter by our higher than normal levels of cash, and our market neutral equity fund (VMNFX)3 which was up 1.5%. Despite a down quarter from US equities, it was our overexposure to more defensive segments of the asset class that hurt us. US consumer staples (VDC), high yield (SPYD), and value (SPYV) were down -6.8%, -3.6%, and -3.6%, respectively. As I discussed in the Investment Environment section of this commentary, Trump aggressively went after the America’s largest trading partner, China, in March. While we find much of Trump’s criticism of trade deficits to be exaggerated, misleading, and at times false, we do share many of his concerns about China’s intellectual property theft, overburdensome regulations, and selective tariffs. And we believe that the US, as the leader of the global capitalist economic system, needs to be the country to address it. But we fear the methods that Trump is using to address China’s trade practices. We fear that Trump could trigger major disruptions and dislocations to the global economy, and significantly damage the intrinsic value of our investments, both domestic and international. The obvious concern for investors about Trump’s bombastic and erratic negotiating tactics is that they could trigger a trade war. Being the two largest country economies ( 42% of global GDP between them last year ), and having more two-way trade than any other pair of countries, a long lasting trade conflict between the US and China would likely trigger recessions in both countries, and perhaps across the globe. One only needs to look back to the negative effects of the Smoot-Hawley Tariff Act of 1930 to know this would a disastrous outcome for workers, consumers, and investors alike. While Trump’s negotiating tactics are unusual for a world leader, at least since WWII, that does not mean that they may not work. It is entirely possible that China blinks and gives in to Trump’s bullying and intimidation techniques. What then? I would argue there would be a wide swath of consumers and companies worse off all, just for the benefit of a narrow group of workers and companies. There’s a reason American consumers buy Chinese goods, and American companies rely on Chinese components and manufacturing—usually price, or quality, or a combination of the two. Restricting American consumers' and companies’ access to these attractive Chinese goods and services will only raise the prices they pay, or lower the quality they receive, or both. Similar statements can be made about changes Trump wants to make to NAFTA in the current renegotiation talks with Mexico and Canada. Let’s take an example of a recent Trump trade “victory” with S. Korea, the third largest foreign supplier of steel to the US. Trump was able to extract three concessions from the S. Koreans in exchange for an exemption on Trump’s steel tariffs: 1) a 30% reduction in S. Korean steel exports to the US, 2) a 20-year extension of US tariffs on imported Korean pickup trucks which was set to expire in 2021, and 3) the ability for US automakers to export up to 50,000 vehicles to S. Korea that do not need to comply with Korean safety standards (fairly useless given that US automakers currently export less that 10,000 of its previous 25,000 allowance). These concessions may cause a modest short term increase in US steel production, and less longer-term competition for American-made pickups. But may also harm American consumers of steel, and pickups, in the form of higher prices and/or lower quality. Trump’s suppression of competition from S. Korea is effectively a tariff by another name. Conveniently, we have a recent example of a US tariff on steel imports from 2002. It was originally set to last for five years, but was pulled after less than two years under pressure from American steel consumers and the World Trade Organization (WTO) which had ruled the tariff illegal. The consensus of economic studies on the tariff’s effect was that it lowered US GDP and employment, with one study putting the net damage of the tariff at 200,000 US jobs and $4 billion in lost wages. Some steel jobs were created by the tariff, but many more jobs in steel consuming industries were lost. We trade because it makes both parties richer—so in general when we trade less, we are poorer for it. Trump has tweeted that trade wars are “easy to win” if you have a trade deficit relative your opponent, and are therefore “good.” Thus with approximately a $300 billion goods and services trade deficit with a combined China and Hong Kong (imports of ~$530 billion, exports of ~$235 billion), it would stand that a trade war would be good for the US to initiate. However, Trump’s reasoning that he has the upper hand on Chinese President Xi appears to be overly simplistic in my opinion. While Xi cannot match Trump’s tariffs on a one for one dollar basis, Xi’s tariffs pack a disproportionate punch, so his tariffs don’t need to match Trump’s tariffs dollar for dollar to inflict similar levels of pain. One reason for this is that US exports to China sport much higher profit margins than Chinese exports to the US. Another reason is that Xi has a much more relative political power in his country, and more support from his population than does Trump. Since coming to power in 2013 on a nationalist pledge to restore China’s past dynastic glory (think of “Make America Great Again,” but on steroids), Xi has rallied his population by painting the West, and the US specifically, as adversaries hellbent on holding China back from its rightful place as a global power. Last month, Xi became “president for life” when the National People’s Congress rubber-stamped Xi’s request to remove the Chinese Constitution’s two-term limit on his presidency. Xi’s grip on his country’s information flow (newspapers, TV, internet), party, and economy is strong, and thus can weather most pain inflicted by US tariffs. Trump’s control over his power structure, in contrast, is much weaker—working within a democratic, capitalist structure, and having historically low approval ratings and an ongoing special counsel investigation of his administration, Trump’s ability to politically withstand a severe, drawn-out trade war would seem to be rather limited. With contentious midterm elections less than seven months away, Trump can afford little dissension within his base before losing GOP control of either the House or Senate. Xi understands this and has deliberately targeting his tariffs against products from swing states, such as soybeans, pork, beef, whiskey, and automobiles. On top of applying his own tariffs, Xi would very likely target American companies operating in China with stepped-up regulations, government encouraged boycotts, and downright harassment. Xi would also likely engineer a devaluation of the yuan to make Chinese companies more cost competitive. Another point of leverage Xi has in his pocket is his country’s $1.2 trillion position in US Treasuries, 8.1% of all outstanding. Xi could conceivably raise US government rates, and in turn borrowing rates across the globe, by going from buyer, to seller. Of course this would also harm the remaining value of China’s Treasuries, and raise borrowing costs within his own country, but his much greater control of the economy allows him to shield his people from job cuts and factory closings by ordering banks to support industries with below market rate loans. The point I am trying to make here is that while Trump may think it is easy to win a trade war against China, I do not. If Trump thinks China will cave in to US pressure, I question how familiar he and his advisors are with Chinese history, their negotiating tactics, and how they conduct their politics and economics. Perhaps Trump actually agrees with me, and his threatening comments are purely to fire up his voter base by giving them an enemy to blame and hate for their own hardships. I think it may be a combination of the two. Either way, I think our investments are worse off for his trade actions. The path Trump should be taking with China is one that involves pressure exerted by the US in coordination with other like-minded trading partners, and the rule of law as arbitrated by the WTO. The Trans-Pacific Partnership (TPP), from which Trump removed the US on his third day in office, was a new trade agreement partly driven by the desire of its 12 participating nations to counteract China and its unfair style of economic competition. Besides lowering tariffs and other barriers to promote trade among the 12 nations, it also set minimum standards for worker safety, environmental protection, intellectual property rights, and government support/subsidies for its industries. The idea was that by working in unison, it would not allow China to divide and conquer its trading relationships. The same can be said about NAFTA and the trade agreement negotiations between the US and the European Union (TTIP) that Trump also pulled out of. During a meeting with Trump on Thursday, GOP politicians from agriculture intensive states pleaded for him to reconsider his negotiating tactics with China and encouraged him to reconsider his stance on the TPP (since renamed the TPP11 or CPTPP after the US’s exit) — and surprisingly Trump promptly ordered his new chief economic adviser Larry Kudlow, and top trade negotiator Robert Lighthizer, to give the TPP a fresh look. While we have fingers crossed and are hoping for the best in the US and China trade relationship, we build our strategies based on risk and reward tradeoffs. For the US equity market, which is running at high valuations on most metrics relative to its history and relative to other regions currently, the decision to be underweight it is easy given the late stages of the economic cycle and the rising risks of being a direct participant in a trade war. All five of our strategies are running US equities at approximately 75% of the level of their respective benchmarks. Our exposure to the Chinese equities, a market which is relatively cheap, is small, but inline with the benchmarks. For example, our balanced strategy (AG-B), has a US equity weighting of 24.1% (benchmark: 31.6%) and a Chinese equity weighting of 1.9% (benchmark: 1.9%). You may have noticed that AlphaGlider, and I, are no longer on Facebook. We left the social networking platform in mid-March when the extent to which Facebook has consistently put profits ahead of ethics was more fully revealed by a series of investigative reports. For my 10 years on Facebook I have been frustrated by its aggressive data collection techniques and its obfuscated privacy control settings, and conflicted by its, and smartphones’ in general, impact on the development of our youth. But Facebook’s usefulness in reconnecting with old friends, and generating awareness of AlphaGlider, kept me on their platform. It is now clear to me that Facebook, and its founder Mark Zuckerberg, never deserved the trust that I had given them these last 10 years. When they became aware that hostile actors were abusing their system to attack our democracy, they looked the other way. When confronted by reporters and politicians about it, they lied. Profits before ethics. Profits before democracy. I wish that the US politicians and regulators would intervene on behalf of Americans’ privacy rights, perhaps along the lines of what the European Union has done for its citizens. Instead, the US government has left companies to regulate themselves in this regard, despite the obvious conflicts of interest. The parallels to the financial industry are striking. I built AlphaGlider on the premise of integrity above all else, putting my clients’ interests ahead of my own. You hear that a lot from financial firms, but we think that in reality, we are pretty unique in this regard. I expect that same level of integrity of the firms that I do business with. Facebook has demonstrated that it lacks integrity. I cautiously remain on Twitter and LinkedIn. 1This material represents an assessment of the market and economic environment at a specific point in time and is not intended to be a forecast of future events, or a guarantee of future results. Forward-looking statements are subject to certain risks and uncertainties. Actual results, performance or achievements may differ materially from those expressed or implied. Information is based on data gathered from what we believe are reliable sources. It is not guaranteed as to accuracy, does not purport to be complete, and is not intended to be used as a primary basis for investment decisions. It should also not be construed as advice meeting the particular investment needs of any investor. 2Mutual funds, exchange-traded funds and exchange-traded notes are sold by prospectus. Please consider the investment objectives, risks, charges, and expenses carefully before investing. The prospectus, which contains this and other information about the investment company, can be obtained directly from the Fund Company or your financial professional. Be sure to read the prospectus carefully before deciding whether to invest. 3Alternative investments, including hedge funds, commodities and managed futures involve a high degree of risk, often engage in leveraging and other speculative investments practices that may increase risk of investment loss, can be highly illiquid, are not required to provide periodic pricing or valuation information to investors, may involve complex tax structures and delays in distributing important tax information, are subject to the same regulatory requirements as mutual funds, often charge higher fees which may offset any trading profits, and in many cases the underlying investments are not transparent and are known only to the investment manager. The performance of alternative investments including hedge funds and managed futures can be volatile. Often, hedge funds or managed futures account managers have total trading authority over their funds or accounts; the use of a single advisor applying generally similar trading programs could mean lack of diversification and, consequently, higher risk. There is often no secondary market for an investor’s interest in alternative investments, including hedge funds and managed futures and none is expected to develop. There may be restrictions on transferring interests in any alternative investment. Alternative investment products including hedge funds and managed futures often execute a substantial portion of their trades on non-US exchanges. Investing in foreign markets may entail risks that differ from those associated with investments in the US markets. Additionally, alternative investments including hedge funds and managed futures often entail commodity trading which can involve substantial risk of loss. 4Rebalancing can entail transaction costs and tax consequences that should be considered when determining a rebalancing strategy. bMSCI Europe, Australasia and Far East (EAFE) Index is a free float-adjusted market capitalization weighted index that is designed to measure the investable universe of developed market equities outside of the US. cMSCI Emerging Markets (EM) Index is a free float-adjusted market capitalization weighted index that is designed to measure large and mid-cap equity market performance in the global Emerging Markets. dMSCI All-Country World (ACWI) Investable Market Index (IMI) is a free float-adjusted market capitalization weighted index that is designed to measure the investable universe of global equity markets. eThe Bloomberg Barclays US Aggregate Bond Index is a market capitalization weighted index that is designed to track most investment grade bonds traded in the United States. The index includes Treasury securities, government agency bonds, mortgage-backed bonds, corporate bonds and a small amount of foreign bonds traded in the United States. Municipal bonds and Treasury Inflation-Protected Securities (TIPS) are excluded due to tax treatment issues. No part of this report may be reproduced in any manner without the express written permisson of AlphaGlider LLC.